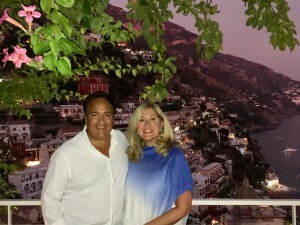 During the trip with his wife Mary Jo, two daughters, and his father, George, the 58-year-old Scofes fondly recalled his mother, Georgia, who succumbed to pancreatic cancer in 2017. Scofes’ paternal grandmother, a Giovanni, was from Sicily – the next increasingly popular Italian location on his vacation bucket list. The Sicilian villages of Savoca and Forza D’Agro outside Taormina were used as settings in the Academy Award-winning film “Godfather Part II.” Bar Vitelli, the terrace café in which Michael Corleone, through an awkward initial meeting with her father, courts Appollonia, the woman he would marry in a nearby church, still operates and welcomes visitors. But first Scofes will bring Sicily, and some of its notorious Cosa Nostra offspring, to Lansing in order to honor his late mother – and her sense of humor – with “Comedians for Cancer’s ‘Night of 1,000 Guidos’”- a fundraiser for Sparrow Hospital’s Herbert Herman Cancer Center. It will feature Italian American actor Vincent Pastore, who played “Sal Bonpensiaro” on the HBO hit mobster show “The Sopranos” and played a “wiseguy” in films like “Goodfellas” and “Carlito’s Way” with “Godfather” star Al Pacino. “I’ve been blessed with a number of friendships with people in show business,” said Scofes, whose own godfather was actor the late actor Robert Loggia who appeared in the movie “Scarface” (also with Pacino), and set in Miami. Loggia, who also reluctantly appeared in “The Sopranos,” introduced Scofes to Pastore. Joey Kola, who has cracked wise on Jay Leno, David Letterman and Rosie O’Donnell’s shows, Al Romero and Johnny Rizzo will also add more yuks to the sauce.